There are some classic recipes that just never get old. You know the ones I’m talking about. . . they show up at potlucks, in church recipe books and on the table when you go back home to visit. 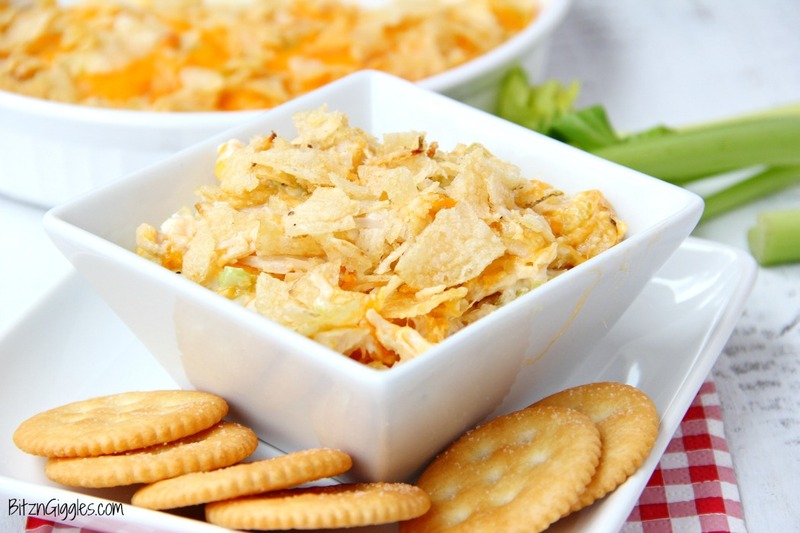 This Chicken Salad Dip is one of them! 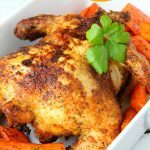 This dip is a twist on a classic hot chicken salad recipe that I’ve had in my own recipe box at home for some time now. 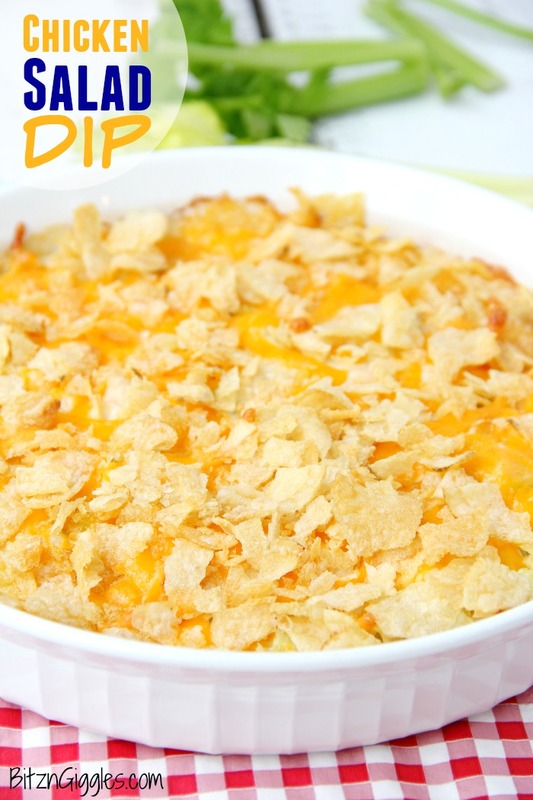 It’s a cheesy and creamy chicken mixture topped with crushed potato chips, perfect for cracker or tortilla chip dipping! I’m assuming you’re a dip lover, too? Dips have always been (and still are) an important piece of my being. We entertain at our house a lot, and whenever I’m creating the menu, you can bet I make room for some sort of dip on the food table. Maybe it’s Cheesy Artichoke Dip or Caramel Apple Dip – maybe it’s Broccoli Cheese Dip – or get this – Cadbury Creme Egg Dip! Dips are super fun to prepare, too! Is anyone with me here? There’s just something about throwing a bunch of ingredients into a bowl, then baking it or just letting it sit in the fridge to allow the flavors to meld. It looks even more beautiful once it’s ready and you’ve transferred it to its serving dish. 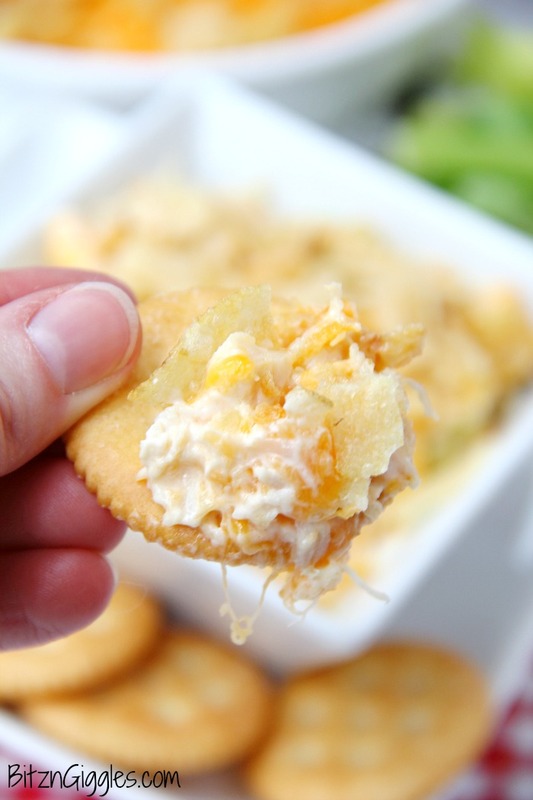 I mean, just look at the golden color this chicken salad dip takes on once it’s baked! It’s the melted cheese and the toasted potato chips! ! Not to mention the chicken and the creamy dreaminess beneath it all! YUM! Pass me a cracker, please! Did you notice I even managed to get a little celery in there, too? Chicken salad always has celery. So, the dip needed it, too – veggies. . .check. It may seem strange to be scooping up crushed chips with another chip, but let me tell you what. After you taste this dip, it won’t seem strange at all. Because you’re going to make this over and over again. There’s just something about dips. I’m telling you. Can I let you in on one more secret before you go? Try serving this on a bun. Yep, you heard me. 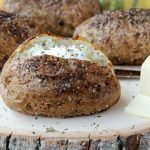 Scoop this onto a bun, crush a few more potato chips over the top and take a big ole’ bite. Switch out the canned chicken for 2 cups of cubed chicken breast, throw in some boiled noodles and make this into a casserole! 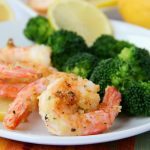 This dish is so versatile! 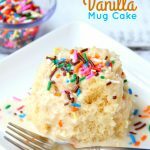 Just have fun with it and enjoy a new twist on an old classic! This easy dip is a twist on a classic hot chicken salad recipe that I’ve had in my recipe box for some time now. 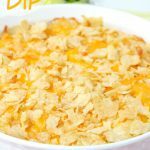 It’s a cheesy and creamy chicken mixture topped with crushed potato chips and perfect for cracker or tortilla chip dipping! Use a fork to work the chicken into smaller pieces – almost shredding it. 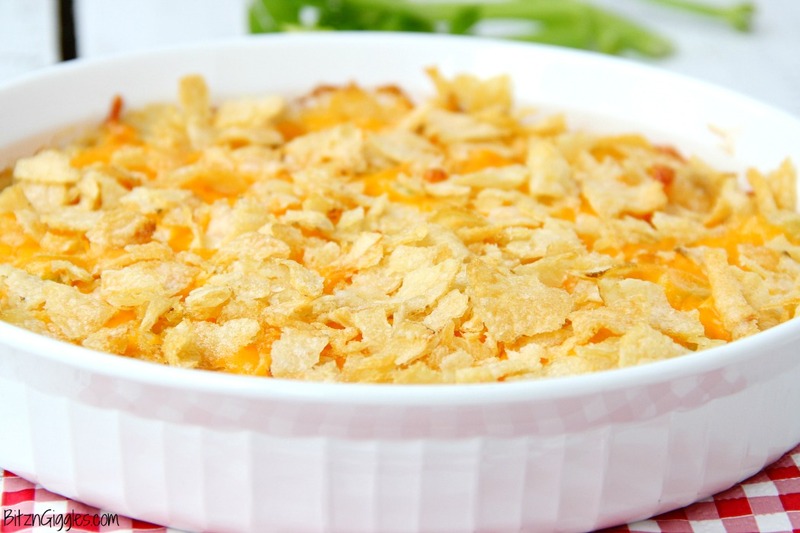 In a bowl, combine chicken, mayo, sour cream, celery, minced onion, pepper, lemon juice and 1 cup of cheese. Transfer to lightly greased 2 quart baking dish. Top with the remaining cup of cheese and potato chips. Bake for 20 minutes or until warm and bubbling. 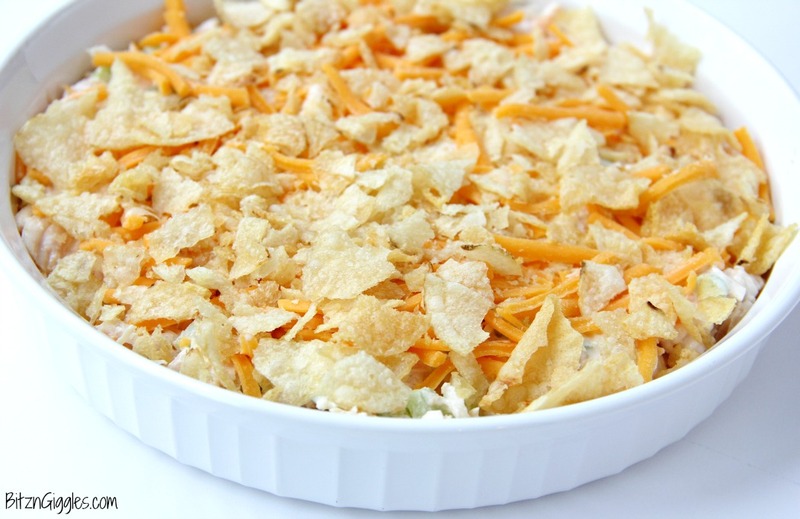 Serve with crackers, tortilla chips or celery.